Charles JG, Verberne H, Conolly P, Dentener PR, Froud KJ, Allan DJ, Suckling DM 2003.The distribution of Argentine ants in New Zealand: Can a ten-year old decision not to eradicate be re-visited? In: Goldson SL, Suckling DM eds Defending the green oasis: New Zealand biosecurity and science. Proceedings of a New Zealand Plant Protection Society Symposium, Centra Hotel, Rotorua, 12 August 2002. Christchurch, New Zealand Plant Protection Society. Pp. 109–124. Cooling M, Hartley S, Sim DA, Lester PJ (2012) The widespread collapse of an invasive species: Argentine ants (Linepithema humile) in New Zealand. Biology Letters 8: 430-433. Corin SE, Abbott KL, Ritchie PA, Lester PJ 2007. Large scale unicoloniality: the population and colony structure of the invasive Argentine ant (Linepithema humile) in New Zealand. Insectes Sociaux 54: 275–282. Corin SE, Lester PJ, Abbott KL, Ritchie PA 2007. Inferring historical introduction pathways with mitochondrial DNA: the case of introduced Argentine ants (Linepithema humile) into New Zealand. Diversity and Distributions 13: 510–518. Lester P, Baring CW, Longson CG, Hartley S. 2003. Argentine and other ants (Hymenoptera: Formicidae) in New Zealand horticultural ecosystems: distribution, hemipteran hosts, and review. New Zealand Entomologist 26: 79–89. Mathieson M, Toft R, Lester PL. 2012. 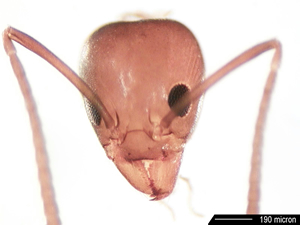 Influence of Toxic Bait Type and Starvation on Worker and Queen Mortality in Laboratory Colonies of Argentine Ant (Hymenoptera: Formicidae). Journal of Economic Entomology, 105(4):1139-1144. Pitt PW, Worner SP, Suarez AV. 2009. Predicting Argentine ant spread over the heterogeneous landscape using a spatially explicit stochastic model. Ecological Applications 19: 1176–1186. Roura-Pascual N, Hui C, Ikeda T, Leday G, Richardson DM, Carpintero S, Espadaler X, Gómez C, Guénard B, Hartley S, Krushelnycky P, Lester PJ, McGeoch MA, Menke S, Pedersen J, Pitt J, Reyes J, Sanders NJ, Suarez AV, Touyama Y, Ward DF, Ward P, Worner SP 2011. The relative roles of climatic suitability and anthropogenic influence in determining the pattern of spread in a global invader. Proceedings of the National Academy of Sciences of the United States of America 108 (1) 220–225. Sagata K & Lester PJ. 2009. Behavioural plasticity associated with propagule size, resources, and the invasion success of the Argentine ant Linepithema humile. Journal of Applied Ecology 46: 19–27. Stringer LD, Stephens AE, Suckling DM, Charles JG 2009. Ant dominance in urban areas. Urban Ecosystems 12: 503–514. Stringer LD, Suckling DM, Mattson LTW, Peacock LR 2010. Improving ant-surveillance trap design to reduce competitive exclusion. New Zealand Plant Protection 63: 248–253. Suckling DM, Peck RW, Manning LA, Stringer L, Cappadonna J, El-Sayed AM 2008. Pheromone disruption of Argentine ant trail integrity. Journal of Chemical Ecology 34: 1602–1609. Ward DF, Stanley MC, Toft RJ, Forgie SA, Harris RJ 2008. Assessing the risk of invasive ants: a simple and flexible scorecard approach. Insectes Sociaux 55: 360–363. Proceedings of the New Zealand Invasive Ant Workshop 29 April 2005, Wellington. Proceedings of the New Zealand Invasive Ant Workshop 13 October 2006, Wellington. Lester P, Longson CG 2002. Argentine ant distribution investigation: Horticultural areas. Unpublished contract report for MAF Biosecurity Authority. 57 p.
Stanley MC 2004. Review of the efficacy of baits used for ant control and eradication. Landcare Research Contract Report LC0405/044. Toft R 2010. Potential for winter/spring control of Argentine ants. Unpublished report for Hawke’s Bay Regional Council. Landcare Research Envirolink Project HBRC117. Toft R 2011a. Research on improving containment of Argentine ant populations. Unpublished report for Tamsan District Council. Landcare Research Envirolink Project TSDC74. Toft R 2011b. Trials of spring baiting for controlling Argentine ants. Unpublished report for Tamsan District Council. Landcare Research Envirolink Project TSDC71. Toft R, Mathieson M. 2012. Reinvasion and boundary control for Argentine ants in urban areas. Unpublished report for Tamsan District Council. Landcare Research Envirolink Project TSDC83. Toft R, Rees J 2009. Advion versus Xstinguish for control of Argentine ants. Unpublished report for Tamsan District Council. Landcare Research Envirolink Project TSDC48. Ward DF 2007a. Ecological risk assessment of exotic ant species in the Tasman region. Landcare Research Contract Report LC0607/137. Tasman District Council Envirolink Project TSDC18. Ward DF 2007b. Measuring the reduction in pest ants. Envirolink Project NRLC52. Ward DF 2007c. Prioritised surveillance for invasive ant species in Southland. Envirolink Project ESRC117. Ward DF 2009. Potential social, economic and biodiversity impacts of the Argentine ant, Linepithema humile, in the Hawke's Bay region. Landcare Research Contract Report LC0809/087. Hawke's Bay Regional Council Envirolink Project: 700HBRC93. Harris R 2001. Eradicating Argentine ants. Stowaways (Landcare Research Newsletter to Biosecurity End-Users) 1: P. 10. Harris R 2002. Argentine ants spread. Stowaways (Landcare Research Newsletter to Biosecurity End-Users) 2: 10–11. Harris R 2002. Scientists win first battles with ants. Landcare Research Discovery Newsletter 1: 3. Harris R 2003. Argentine ant update. Stowaways (Landcare Research Newsletter to Biosecurity End-Users) 3: 12–13. Stanley M, Ward DF, Toft R 2005. Exotic ants in NZ: A ticking timebomb? Protect Magazine (Biosecurity Institute), Autumn Issue. Pp. 25–27. Ward DF 2005. Changes to the classification of ants (Hymenoptera: Formicidae). The Weta 30: 16–18. Ward DF, Stanley M, Forgie S, Toft R, Rees J 2008. Ecological impacts of Argentine Ants in New Zealand. Protect Magazine (Biosecurity Institute), Summer Issue. Pp. 16–18. Haw JM. 2006. Effects of Argentine ant (Linepithema humile) on arthropod fauna in New Zealand native forest. Unpublished Phd thesis, University of Auckland, New Zealand. Pitt JPW 2008. Modelling the spread of invasive species across heterogeneous landscapes. Unpublished PhD thesis, Lincoln University, Canterbury, New Zealand. Sung K. 2005. Environmental limitations of Argentine ants. Unpublished MSc thesis, University of Auckland, New Zealand. Thompson JME. 2010. Coexistence in ant communities invaded by the ecologically dominant Argentine ant. Unpublished MSc thesis, University of Auckland, New Zealand.